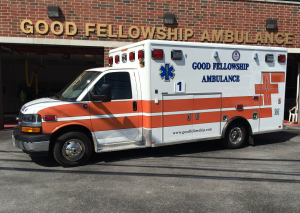 Good Fellowship Ambulance operates a fleet of nine state of the art vehicles and a special operations trailer to provide basic, intermediate, and advanced life support ambulance transports, supervisor operational and administrative duties, special event standbys, emergency incident rehabilitation and community training. 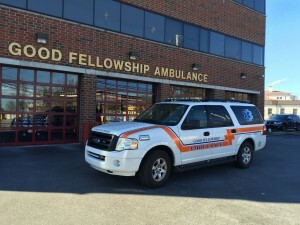 Good Fellowship rotates the ambulance’s response order monthly, in order to spread out the work load over six units. Vehicles are replaced as needed, typically every four to six years. Ambulance A is a 2014 Chevrolet 4500/Horton Concept 3, Type III ambulance built by Horton Emergency Vehicles. A truck is equipped and licensed as an Advanced Life Support Unit by the Pennsylvania Department of Health. A truck is capable of transporting 2 patients at a time and is used for both ALS and BLS calls as well as interfacility transfers. A truck features a completely reflective striping pattern, Rosco Vision road safety camera system and 360º LED lighting. A truck is also equipped with a Mobile Data Computer, On-spot chains for winter weather and an AED (Automated External Defibrillator). Ambulance B is a 2016 Ford E-450/Lifeline Superliner Type III ambulance. B truck is equipped and licensed as a Basic Life Support Unit by the Commonwealth of Pennsylvania. B truck is capable of transporting 2 patients at a time and is used for both ALS and BLS calls as well as interfacility transfers. B truck features a completely reflective striping pattern, Rosco Vision road safety camera system and 360º LED lighting. B truck is also equipped with a Mobile Data Computer (MDC), On-spot chains for winter weather and an Automated External Defibrillator (AED). Ambulance C is a 2014 Chevrolet 4500/Horton Concept 3, Type III ambulance built by Horton Emergency Vehicles. 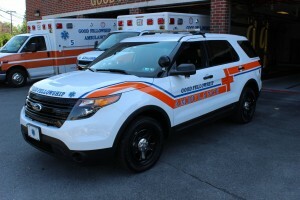 C truck is equipped and licensed as a Basic Life Support Unit by the Commonwealth of Pennsylvania. C truck is capable of transporting 2 patients at a time and is used for both ALS and BLS calls as well as interfacility transfers. C truck features a completely reflective striping pattern, Rosco Vision road safety camera system and 360º LED lighting. C truck is also equipped with a Mobile Data Computer, On-spot chains for winter weather and an AED (Automated External Defibrillator). Ambulance D is a 2011 Ram 4500 4x4/Lifeline Paraliner Type I ambulance built by Lifeline Emergency Vehicles. D truck is equipped and licensed as a Basic Life Support Unit by the Commonwealth of Pennsylvania. D truck is capable of transporting 2 patients at a time and is used for both ALS and BLS calls as well as interfacility transfers. D truck features a completely reflective striping pattern, Rosco Vision road safety camera system and 360º LED lighting. Other features of D truck include 4-wheel drive for off road access or bad weather, Mobile Data Computer (MDC) and an AED (Automated External Defibrillator). This vehicle is scheduled for replacement in 2019. Ambulance E is a 2015 Ford T-250 Type II ambulance converted by American Emergency Vehicles (AEV). 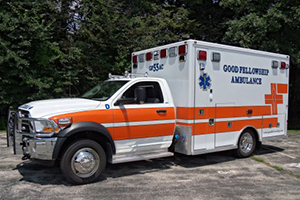 E truck is equipped and licensed as a Basic Life Support Unit by the Commonwealth of Pennsylvania. E truck is capable of transporting 2 patients at a time and is used for both ALS and BLS calls as well as interfacility transfers. E truck features a reflective striping pattern for safety and a Rosco Vision road safety camera system. Other features of E truck include a Mobile Data Computer (MDC) and an AED (Automated External Defibrillator). 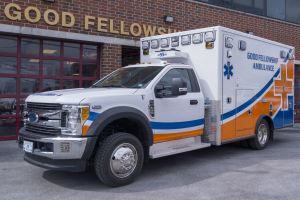 Ambulance F is a 2017 Ford F-450/Lifeline Paraliner Type I ambulance built by Lifeline Emergency Vehicles. 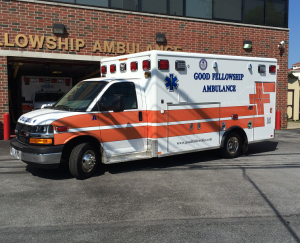 F truck is equipped and licensed as a Basic Life Support Unit by the Commonwealth of Pennsylvania. F truck is capable of transporting 2 patients at a time and is used for both ALS and BLS calls as well as interfacility transfers. F truck features a completely reflective striping pattern, Rosco Vision road safety camera system and 360º LED emergency lighting. Other features of F truck include 4-wheel drive for off road access or bad weather, Mobile Data Computer (MDC) and an AED (Automated External Defibrillator). 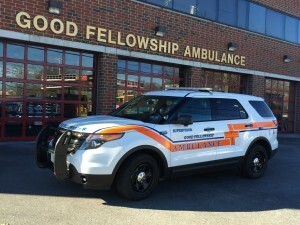 Squad 55A is a 2015 Ford Interceptor Utility converted by 10-8 Emergency Vehicle Service. This vehicle is equipped with many features including a Rosco Vision road safety camera system, mobile data computer (MDC) and all-wheel drive for off road access or bad weather. The vehicle carries intermediate and advanced life support equipment, cardiac monitor, basic medical supplies and an automated external defibrillator (AED). This vehicle is used by Paramedics to respond to incidents. Squad 55B is a 2008 Ford Expedition EL converted by Odyssey Automotive Specialty. 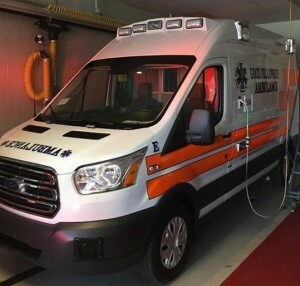 The vehicle is licensed by the Pennsylvania Department of Health as a Quick Response Unit, able to provide basic, intermediate and advanced life support services. Squad 55B is equipped with a mobile data computer (MDC), Rosco Vision road safety camera system and 4-wheel drive for off road access or bad weather. 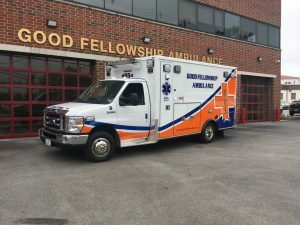 The vehicle carries a variety of equipment including forcible entry/hand tools, an automated external defibrillator (AED) and a variety of medical supplies. Squad 55B is used to tow Rehab 55, serve as a backup Paramedic responder unit, supervisor unit or can respond any incident requiring additional support. The Supervisor's vehicle is a 2015 Ford Interceptor Utility converted by 10-8 Emergency Vehicle Service. This vehicle is equipped with many features including a mobile command center, mobile data computer (MDC), Rosco Vision road safety camera system and all-wheel drive for off road access or bad weather. The vehicle is licensed by the Pennsylvania Department of Health to provide basic, intermediate and advanced life support services. The vehicle carries a variety of equipment including forcible entry/hand tools, an automated external defibrillator (AED), numerous EMS command/mass casualty equipment and a variety of medical supplies. This vehicle is used by the Chief of Operations for responding to incidents such as motor vehicle accidents, structure fires, mass casualty incidents or any incident requiring additional support. Special Operations Trailer "Rehab 55"
The Special Operations trailer is equipped with necessary supplies for emergency incident rehabilitation. The special operations trailer is pulled by Squad 55 to emergency scenes such has structure fires to provide tents, water, chairs and medical supplies for personnel. 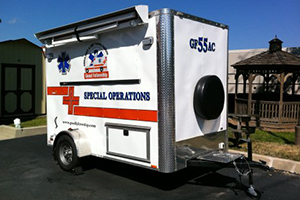 The trailer is also used for special events and can be setup as a mobile sub station for personnel.The special operations trailer, and 3 others just like it, were built by CrewBoss, located in Oregon and purchased with funds allocated for Chester County from the Southeastern Pennsylvania Terrorism Task Force.